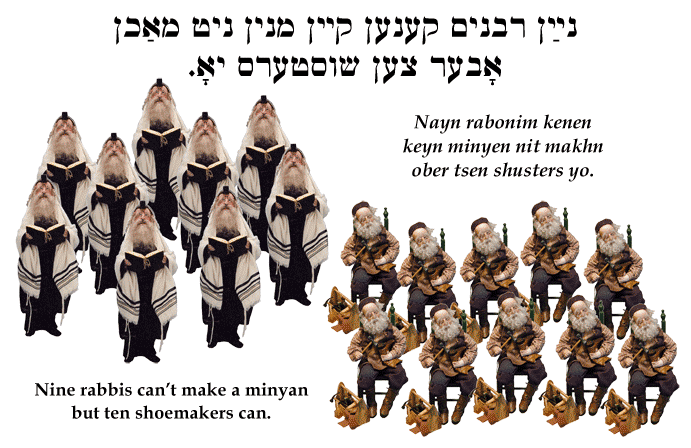 Yiddish Wit: Nine rabbis can't make a minyan but ten shoemakers can. נײַן רבנים קענען קײן מנין ניט מאַכן אָבער צען שוסטערס יאָ. Nayn rabonim kenen keyn minyen nit makhn ober tsen shusters yo. Nine rabbis can't make a minyan but ten shoemakers can. SOURCE: Bernstein, Jüdische Sprichwörter und Redensarten. A minyan is a quorum of ten adult males required for a Jewish prayer service.